Pep Art designs have been created by artist Robert Wilhelm of Ann Arbor, Michigan. The designs of these fanciful wooden salt and pepper mills are inspired by Native American Indian totems and fetishes. 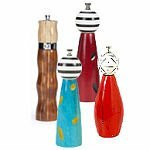 Each pepart pepper mill is hand crafted and hand painted. Pep Art: stylish and functional!